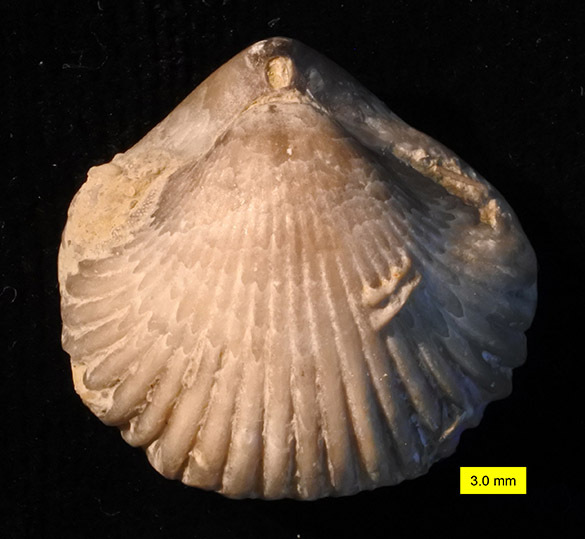 Another beautiful brachiopod this week from our friend Mr. Clive Champion in England. His donations to our collections have considerably enriched our teaching program, especially for brachiopods! This specimen is the rhynchonellid Kutchirhynchia morieri (Davidson, 1852) from the Middle Jurassic (Upper Bathonian) of Luc-sur-Mer, France. This is a view of the dorsal side with the dorsal valve on top with the ventral valve (containing the round opening from which the stalk-like pedicle extended) seen below it. Like most rhynchonellids, the valves have distinct plicae (thick ridges) where the shell is tightly folded. This is the ventral view showing only the exterior of the ventral valve. Note the curved serpulid worm tube attached near the center, and the squiggly borings. 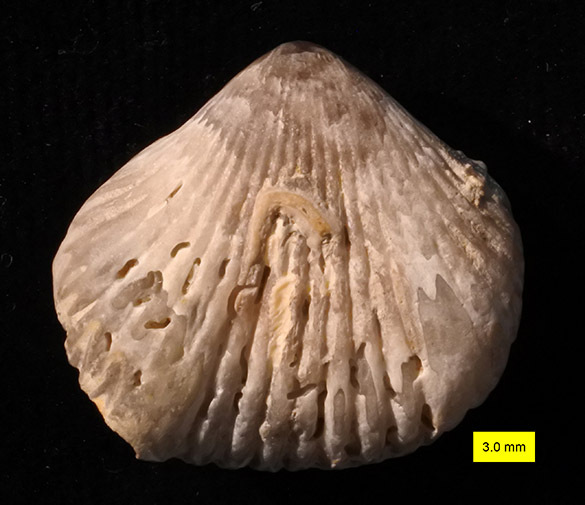 These were likely sclerobionts (hard substrate dwellers) that occupied the brachiopod shell when the animal was still alive, since the dorsal and ventral valves are still articulated. The borings are probably of the ichnogenus Talpina, but I would have to grind down the shell to know for certain. The genus Kutchirhynchia was named by Sydney Savory Buckman (1860-1929) in 1917. We met Buckman earlier in this blog when looking at another of his Jurassic rhynchonellid genera, Burmirhynchia. We learned a lot more about Buckman this summer during our expedition to the Jurassic of Dorset, where he did much of his work. He is best known there as an ammonite worker and stratigrapher (and massive taxonomic splitter). The species Kutchirhynchia morieri was named by the Scottish paleontologist Thomas Davidson (1817-1885), who originally placed it in the large genus Rhynchonella. Buckman acknowledges Davidson in an ammonite monographs as one of his “earliest geological friends”. (Davidson was 43 years older than Buckman.) 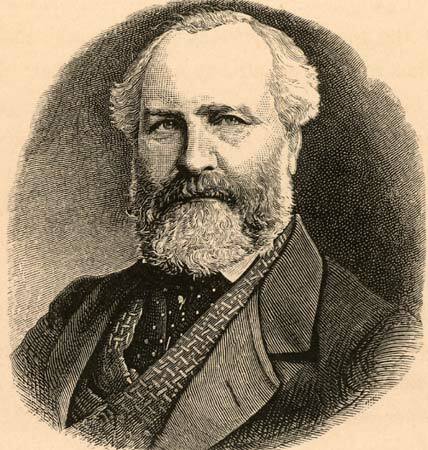 Davidson was born in Edinburgh to wealthy parents. He studied at the University of Edinburgh and then in France, Italy and Switzerland, where he made many long geological tours. He was convinced by the German paleontologist Christian Leopold von Buch (1774-1853) to work on fossil brachiopods. (Von Buch was 43 years older than Davidson. Nice to see the older generation having an effect on those kids!) Davidson stayed with brachiopods his entire career, producing massive monographs on both fossil and recent forms. He engraved his own plates on stone, and there are more than 200 of them. Davidson was elected a fellow of the Geological Society of London in 1852, awarded the Wollaston medal in 1865. In 1857 he was elected a Fellow of the Royal Society, receiving their Royal medal in 1870. Upon his death in Brighton, England, in 1885, his entire collection of fossil and recent brachiopods went to the British Museum. 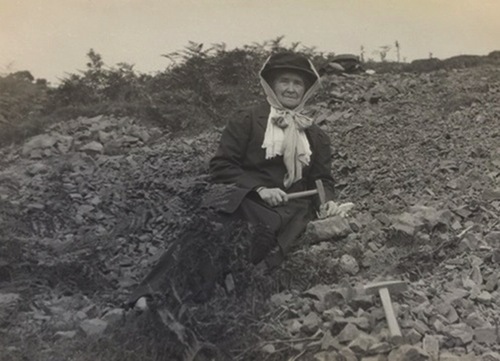 This is a good place to mention Elizabeth Anderson Gray (1831-1924), an important fossil collector in Scotland who supplied Thomas Davidson and many other paleontologists with critical specimens for their work. She is one of the many unnoticed heroes of paleontology, being rarely acknowledged publicly and then overshadowed by her husband. She worked primarily in the Ordovician and Silurian and so did not give Davidson Jurassic rhynchonellids, but she provided hundreds of brachiopods from the early Paleozoic. I love this image of her knocking out fossils with a hammer, just like we do today. Trowelblazers has an excellent biographical page on Elizabeth Anderson Gray. Buckman, S.S. 1917. The Brachiopoda of the Namyau Beds, Northern Shan States, Burma. Palaeontologia lndica 3(2): 1-254. Gilman, D.C., Thurston, H.T. and Colby, F.M., eds. 1905. 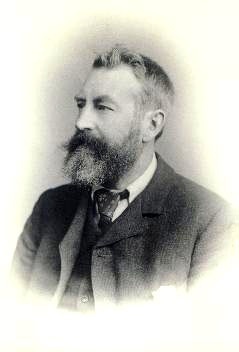 Davidson, Thomas (paleontologist). New International Encyclopedia (1st ed.). New York: Dodd, Mead. Shi, X. and Grant, R.E. 1993. Jurassic rhynchonellids: internal structures and taxonomic revisions. Smithsonian Contributions to Paleobiology, Number 73, 190 pages. My antennae are twitching. Collected a lot of stuff like this in 1972, but it’s loose on the beach and a good number of them are modern Polydora. I think science requires the ultimate sacrifice of cutting the specimen in half and seeing if the borings also penetrate the matrix. With luck this exercise will also allow you to see the exquisite pelleted texture of the original sediment fill. Always a good sign, the twitch of your antennae. I would think that if the borings were modern they would be evenly spread on both valves. Good hypothesis, though, so a grind of this puppy seems in order.